Amidst skirmishes along the Line of Control (LoC) and a threat of further military escalation between Pakistan and India that could lead to the menace of nuclear conflict in South Asia, a flicker of hope appears in the form of a satirical rap song by the dynamic sister duo, Bushra Ansari and Asma Abbas. Illustrating the harsh realities and craving for amity, the song Humsaye Maa Jaye has gone viral on various social media platforms and is immensely appreciated by Pakistanis and Indians alike. The Punjabi song is written by Ansari and Abbas’ elder sister and poetess, Neelum Ahmed Bashir. It is a straightforward rap tête-à-tête between two neighbours who are sharing their feelings and love for each other irrespective of the hostilities between their countries. The song’s description on Ansari’s newly launched YouTube channel states that it is “a music video that goes beyond war and borders to the hearts of people living so close, and yet so far away…”. Sung and performed by Ansari and Abbas, Humsaye Maa Jaye sounds like a folk tappa highlighting the metaphors and a dialect native to the Punjab region of the subcontinent. It depicts the emotional outbursts of a Hindu and a Muslim woman living on either side of the Pak-India border. Nicknaming each other Gwandne, a Punjabi word which means ‘neighbour’, both village women candidly exchange their thoughts about core socio-economic issues, political cataclysms as well as the consequences of a nuclear war that could endanger civilisation. Directed by Iqbal Hussain, the four-minute song impeccably reveals the public opinion with a tinge of cynicism. The lyricist tries her best to endorse the notion that communal resilience combined with profound friendship should swap political and military clashes between the two nations. The essence of the song touches upon every sensible mind and heart that wishes to have a peaceful atmosphere in the region. The video shows that Abbas is a Muslim woman from Pakistan who shares a dividing wall with her Hindu neighbour Ansari, who is from an Indian village. Both women are busy in their kitchen while conversing with each other. This casual chatter is beautifully adorned with beguiling rap rhymes. The unpretentious yet deep verses illuminate the ugly face of political dogmas and games, the war mongering and harmful projection by electronic and print media, as well as the hate speech that the media propagates. “Nothing, it’s just politics playing games. I have heard on TV that you are my enemy. The song further draws attention to ground realities and issues that people of both nations are facing and suffering from, such as poverty, hunger, water scarcity and electricity crisis. “We face similar everyday problems of food, water and electricity. “If the atoms explode, the birds and crows will die. We will also die like sitting ducks. “Let’s just pick up the bombs and throw them in fire. Let’s collect school fees and get our kids educated. 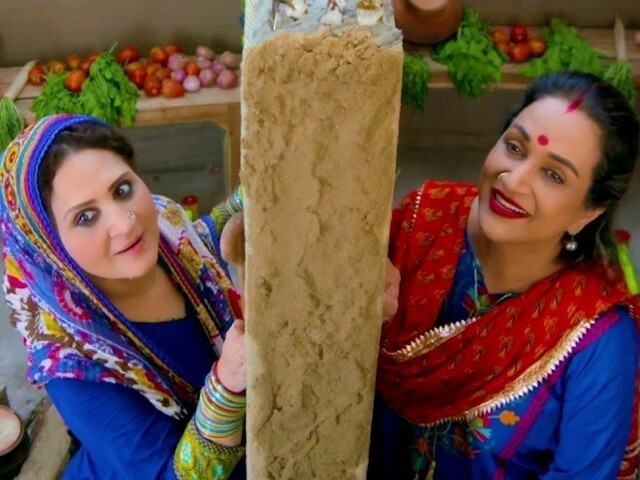 In the last segment of the video, both women hope for peace and try to show their affection for each other by exchanging their chunnies (a Punjabi word for dupatta). They decide not to worry about petty issues or concentrate on negativity, instead they choose to sing and dance to legendary musical scores produced by their countries. All in all, Ansari and Abbas’s Humsaye Maa Jaye is a marvellous attempt to highlight the reality of the situation and de-escalate the tensions between the two nuclear powers. The song amazingly covers the real root causes of deteriorating Indo-Pak relations. These mesmerising verses actually portray how Indians and Pakistanis really think about each other and comprehend war-like situations. Such fearsome endeavours are envisioned to reject the war-mongering of senseless Indian media as well as Bollywood stars who attempt to spread war hysteria just to receive a few ‘likes’ and ‘retweets’ on social media. Simply put, sister duo Ansari and Abbas played their positive role in peace-building through their thought-provoking song which is not only entertaining but also highlights the voice of peaceful people of nuclear-armed arch rivals. Following the Pulwama attack in Indian-occupied Kashmir (IoK) in February, Pakistan has taken numerous steps to de-escalate the situation by inviting India for dialogues. In order to diffuse the tension, Pakistan’s Prime Minister Imran Khan released the Indian pilot Wing Commander Abhinandan as a peace gesture. Pakistan has been trying to resolve the matters with India and the announcement to release 360 Indian prisoners, out of which 100 fishermen have already been released, is another indication towards the peace process. The global community acknowledged and appreciated Pakistan’s positive attitude. However, if Narendra Modi and Bharatiya Janata Party (BJP) are scamming to win the upcoming elections, Indians should take notice of such warmongering politicians who will always pick destructive warfare over peace-making. One can only hope that he will fail in befooling the Indians, the hatred walls he is trying to build will shatter, and there will be dialogues for unresolved bilateral issues. Because as this song highlights, people on either side of the border do not want to hate each other or go to war.